I used the poem "The New Colossus" by Emma Lazarus to review rhyme scheme, allusion, assonance, alliteration, metaphor, and oxymoron. It also helps with inferencing as the subject of the poem is not explicitly stated. I have used this in the past with 6th and 7th grade, but it could be adapted for 5th-10th. 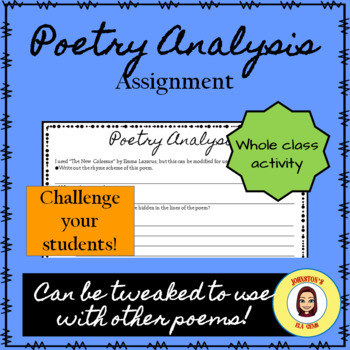 It can be easily modified for use with other poems.